A group of Canadians affected by CIA brainwashing experiments conducted at McGill University's Allan Memorial Institute met for the first time on Sunday to start organizing for a public apology and compensation from the federal government through a possible class-action. Around 40 people gathered at a Montreal condo to share their stories, cry and support each other. The pain, many said, was palpable in the room. 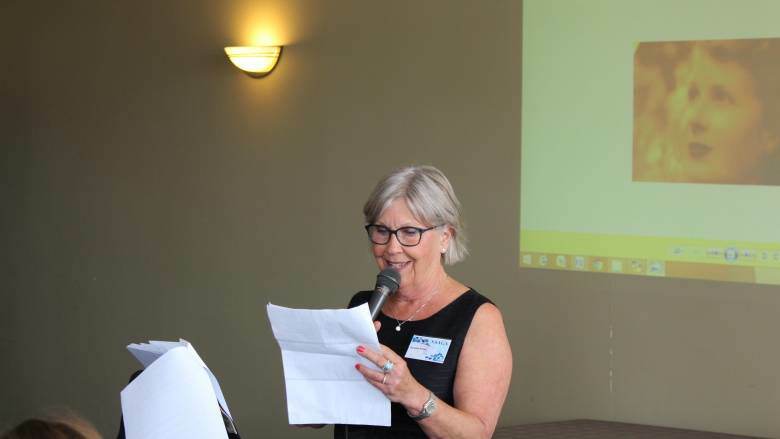 "The government should offer an apology and there should be recognition of the injustice that was done," says Gina Blasbalg, who became a patient at the Allan in her teens in 1960, and drove with her husband from Richmond, B.C., to attend the weekend meeting. ​Survivors Allied Against Government Abuse (SAAGA), as the group calls itself, includes both victims and family members of people who were unwitting participants in brainwashing experiments conducted under the supervision of Dr. Ewen Cameron, director of the psychiatric hospital between 1943 and 1964. Cameron, co-founder of the World Psychiatric Association and president of various other psychiatric associations over his career, ran "depatterning" and "psychic driving" experiments that attempted to erase a patient's memories and reprogram them with new thoughts. He tested experimental drugs like LSD and PCP, medically induced sleep for extended periods, and oversaw extreme forms of electroshock therapy and sensory deprivation. Many of his patient's brains were then left damaged. The federal government provided Cameron with more than $500,000 between 1950 and 1965 — $4 million in today's dollars — along with a smaller amount of funding from the U.S. Central Intelligence Agency, using a front organization called the Society for the Investigation of Human Ecology. Today, many people argue that Cameron's experiments are part of the foundation for contemporary psychological torture techniques. Four daughters of victim Violet Winnifred Malboeuf came from various towns in Quebec and Ontario to attend Sunday's meeting. Janice Shaw explained that she and her siblings all had extremely difficult childhoods without their mother, but now they are relieved to know that there are other people to talk to who went through similar experiences. The sisters and their two brothers were placed in foster care because their mother was incapable of raising them after her stay at the Allan Memorial Institute. A few days ago, they received some of their mother's medical records from the Department of Justice. One of the documents was a handwritten letter by their mother outlining her experience at the Allan. Sunday's gathering would not have happened without CBC News investigative journalist Elizabeth Thompson. She regularly checks the government public account records for story ideas, and noticed a line about compensation for someone who had been depatterned at the Allan Memorial Institute. Thompson, who grew up in Montreal and worked for local newspapers, knew the history of the Allan Memorial Institute and was intrigued. She called Montreal lawyer Alan Stein, who has represented numerous survivors of the Allan, and he confirmed that one of his clients, Alison Steel, was the person who received the compensation last year — long after her father first attempted to get compensation in the 1990s. They had reached an out-of-court settlement with the Canadian justice department in exchange for dropping the lawsuit, and Steel had to sign a non-disclosure agreement. ​The recent CBC News articles and The Fifth Estate documentary Brainwashed led to a flood of emails from victims and their families. People wanted to know how to access medical records and compensation, and more than anything they wanted to connect with each other. Steel agreed to talk with them so The Fifth Estate sent along their emails. "For awhile there I was receiving two or three calls per day," Steel says. "People didn't want to talk about it, but now they are realizing that so many others are in the same boat." At the meeting, Steel was overwhelmed that everyone had finally come together. Last February, they organized a private Facebook group and came up with a name. They created SAAGA, with the goal of seeking justice, a public apology and compensation. SAAGA announced at the Sunday meeting that Stein has agreed to assist the group in launching a class-action lawsuit to sue the Canadian government, maybe also the Quebec government and the Allan Memorial Institute. It would first have to be approved by the Quebec Superior Court, which could take four to six months, Stein said. In an email, the Justice Department told CBC News that a 1986 inquiry by George Cooper into Cameron's depatterning work "concluded that Canada did not hold any legal liability or moral responsibility in respect of these treatments." "As this matter may be before the courts it would be inappropriate to comment further." The Fifth Estate began exposing wrongdoing at the Allan Memorial Institute in 1980 and continues to follow this story. We are in the process of building a website where we will gather together the stories of patients who underwent the brainwashing experiments, and their families. If you would like to share your family's story, please send us an email: [email protected] We will try to include as many stories as possible on the website.